Sebastian Vettel beat Red Bull team-mate Mark Webber to top spot in an incident-strewn second Formula 1 practice session at Suzuka. Lewis Hamilton and Fernando Alonso both had moments at the Degners – the latter doing well to save a spin without damage – while Kimi Raikkonen, Sergio Perez and Pastor Maldonado all suffered early exits after accidents. Perez’s off was the most dramatic: the Mexican clipped the Astroturf on the entry to Spoon with his McLaren’s rear right and was pitched sideways into a heavy collision with the barriers. 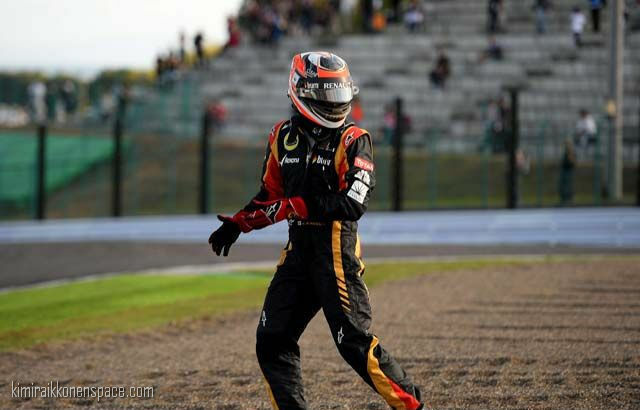 Williams driver Maldonado also hit the tyres – this time at Degner, just 12 minutes into the session – while Raikkonen lost the rear of his Lotus and ended up beached in the gravel at Dunlop 30 minutes from the session’s end. The Finn still ended the session fourth fastest, as the field collectively switched to long runs for the final third of the afternoon. Damn, thats weird, two mistakes from Kimi in two GPs, we are not used to that n i’m quite cnfused. I stopped watching shortly after Kimi’s flying lap on the medium, i’m so happy n relieved about the time he set, hope we’ll also see a very good FP3 to avoid tackling the quali on the backfoot. I’m sure a podium is almost guaranteed with a top 5 on the grid and if Kimi is to fight for victory he should not let Vettel open a 5 sec gap before the first stint. It won’t be easy though. Maybe we’ll see Kimi’s famous one-less pitstop strategy this weeknd since we have the two harder compounds. C’mon Kimi. Let´s hope, the spin of this weekend has made and now everythings will go just the very best way! The pace was OK and as he told – the car felt pretty good! Go Kimi!! P.s.Of course, the sad news…..Maria de Villota…..R.I.P.